LG's latest phones themselves haven't been horrible, but the bang for the buck they've been offering hasn't been great. The V30+, an upgraded V30 with more storage and earphones included, was released back in late 2017 at an MSRP of a whopping $929.99. This latest Amazon deal brings the price down to a much more reasonable $399.99, though it's only available for around 10.5 more hours as of publishing time. The LG V30+ has a 6.0" 1440p OLED display, a Snapdragon 835, 4GB of RAM, 128GB of storage with microSD expansion, a 16MP + 13MP wide-angle rear camera setup, a 5MP front-facing camera, and a 3,300mAh battery. It also has IP68 certification and LG's Second Year Promise, which adds an extra year of warranty for a total of two years if you register for it. The phone is unlocked for any major US carrier - AT&T, T-Mobile, Sprint, Verizon, and any of their MVNOs. 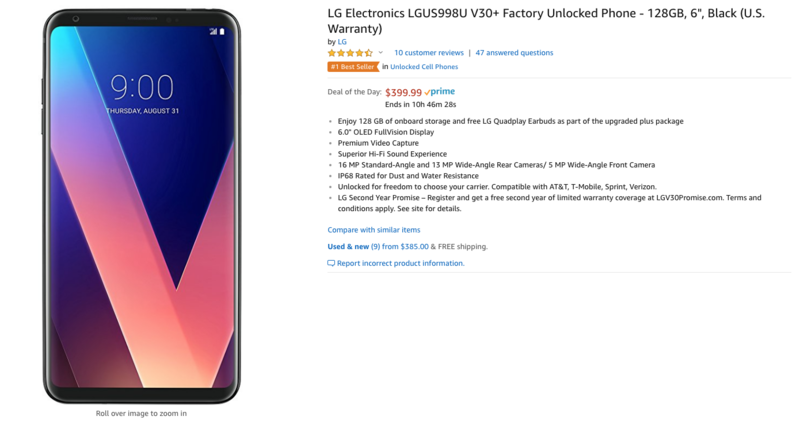 This $399.99 price is the lowest price we've seen by far for the V30+; the previous all-time Amazon low was $600. The listing isn't sold by Amazon, but it does have Prime shipping because it's fulfilled by Bezos and friends. Again, the deal will be live for another 10.5 hours, so don't wait too long if you want one.